BANGI, 7 Mar 2014 – Student entrepreneurs eager to produce advanced animation films have been urged to take advantage of the loan facility of the Graduate Entrepreneur Fund of which RM16 million is already being made available. That amount is part of the original RM50 million allocated when it was launched by the government earlier this year. Deputy Finance Minister Datuk Hj Ahmad Maslan said multimedia students from The National University of Malaysia (UKM) and other universities can apply through the SME bank and ask for a Creative Multimedia loan from the fund. Speaking when launching the Creative Multimedia Competition organised by students of UKM’s Faculty of Technology and Information Sciences (FTSM), Ahmad Maslan said student entrepreneurs below 40 are eligible to apply for up to RM500,000. They only need to convince the bank that their business model is viable. 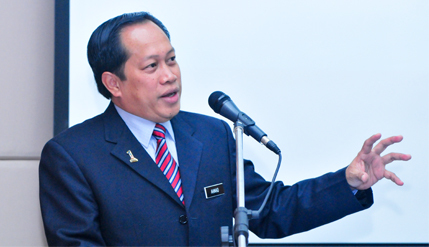 Ahmad Maslan said multimedia entertainment can generate good income if the content has a story-line that can attract an international audience . He was, however, disappointed that apart from local animation films like ‘Upin’ and ‘Ipin’ which are popular in Malaysia and Indonesia , no local multimedia productions have actually penetrated the international market . There is also not much local animation shows available on satellite channels in Malaysia and even if there are they are not as good as the imported ones. Malaysia must also produce creative works that are affordable, he said. Ahmad Maslan hoped the Creative Multimedia Competition taking place from today would schowcase multimedia animation talent from among the 11 institutions of higher learning taking part. The competition ends on Sunday (March 9). Apart from UKM, other universities taking part are Universiti Malaya (UM), Universiti Tenaga (UNITEN), University College Bestari( UCB ), Universiti Teknologi MARA (UiTM) and Universiti Sultan Zainal Abidin (UniSZA) . The Malaysian Prime Trust Foundation (Yayasan Amanah Perdana Malaysia), Digital Malaysia and the Multimedia Super Corridor were the official sponsors. Present at the launching were UKM Vice Chancellor Prof Datuk Dr Noor Azlan Ghazali, Dean of FTSM Prof Dr Abdullah Mohd Zain and Chief Executive of the Malaysian Prime Trust Foundation Hajjah Nor Baini Masri.